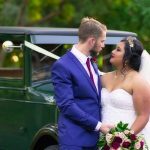 Maleny Wedding Ceremony at Tiffany’s Wedding Chapel. It’s always a pleasure to head up to the Sunshine Coast Hinterlands and film in Maleny and Montville. It’s such a picturesque setting for a wedding.